How to Install Kodi 17.1 Android TV Box + TVADDONS! This tutorial shows you how to Install Kodi 17.1 Android TV Box version. Connect your Android TV Box to your WiFi network using the “Settings – Network” area of your Android TV Box. If Google Play Store asks you to sign in to a Google account, then sign in to a Google account using the username and password. After Google Play Store is fully launched and displays the “Search” box, enter “Kodi” into the Search box. In the search results, select Kodi. After Kodi launches, install TV Addons and set up an Android VPN to protect your streaming data & browsing history. SportsDevil is a TV addon that was once at the top of the Kodi sports game, but is now so-so. Try Sports Devil or.. Install Kodi NO LIMITS build, which is a truly amazing combination of TV addons and a great user interface. NO LIMITS FireStick Lite version is made just for Amazon FireStick, so it’s lightweight enough to run well on low-powered devices. It also uses the Kodi 16 Jarvis skin, which is more familiar to some users. Or check out Wookie Wizard for Kodi, which is a great Kodi build. Then we have the Kodi 17.1 Config Wizard, which is the official TVAddons team’s build. In Google Play Store, search for IPVanish. In the search results, select IPVanish VPN app (click here to go to the download page). After IPVanish Android app installs, press Open. Then log in to your IPVanish account. Don’t have one? Get one for $4.87/mo with our exclusive 60% off coupon. After you’re logged in to IPVanish, select a server from the list of servers. Test your VPN connection using the steps below. To see your VPN working, go to whatsmyip.org to see your IP address after you’re connected to the VPN. Then disconnect from the VPN using the “Disconnect” button in the IPVanish app, go to whatsmyip.org again, and compare the two addresses. If the two addresses are different, then the VPN app was successful in connecting your Android smartphone to the VPN server! Your Android TV Box isn’t connected to your WiFi network, or your Internet connection is having problems. To troubleshoot this, check to see if your other WiFi devices can connect to the Internet successfully (actually browse a webpage). It’s also possible that Google Play Store won’t let you install apps because you need to enter a Google ID. This can be any Google account! You can even create a Gmail account and use that username and password just for Google Play Store on your Android TV Box. Your Internet Service Provider could be limiting the bandwidth they give you to stream Kodi movies. Using a VPN will circumvent this completely. If your Android TV Box is having display issues, then check the HDMI cable. Many Android TV Boxes, like the one I have, must have a very solid HDMI connection to display properly. Otherwise, the sound was “crunchy” and was going in and out. Try downloading the Kodi APK file directly, which is at http://bit.ly/kodi173arm. This bypasses the Google Play Store, in case you can’t connect to Google Play Store on your Android device / tablet / smartphone. 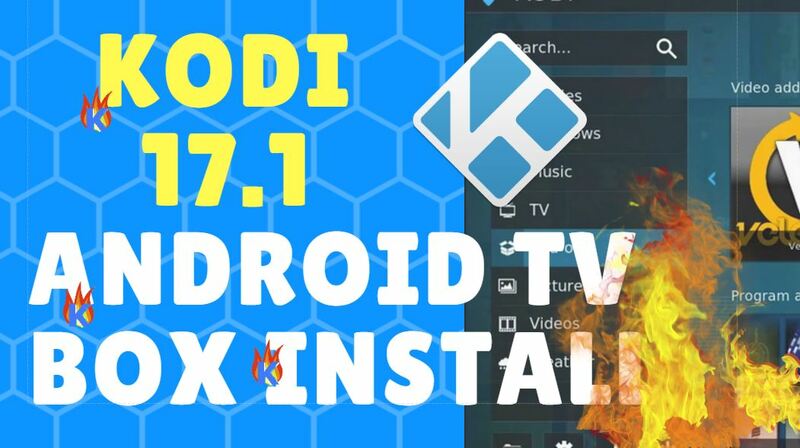 How to Install Kodi 17.1 Android TV Box: 1) Connect WiFi, 2) Launch Google Play Store, 3) Search for Kodi, 4) Press Install -- OR Download Kodi APK File.